A huge thank you to Peter at Perfectly Green Artificial Grass for donating a few rolls of artificial grass for our casualties. 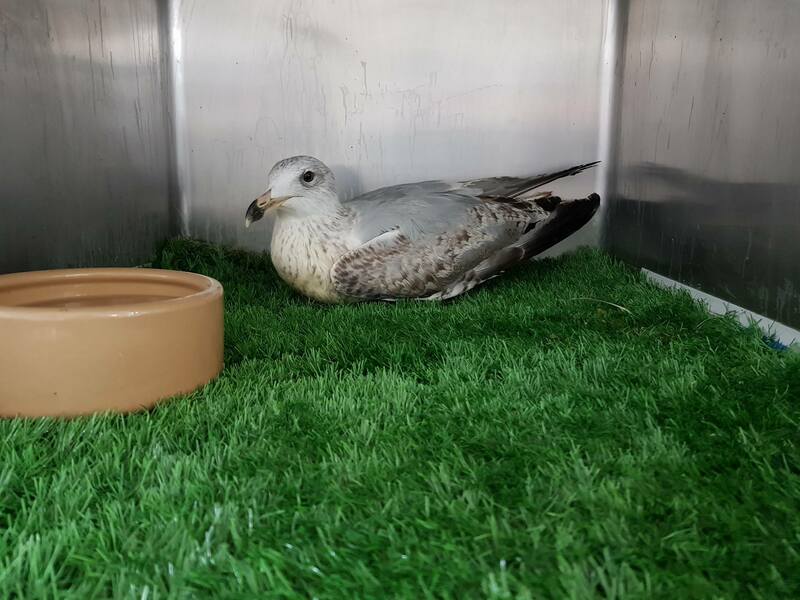 Our gulls are loving having the new soft realistic grass under their feet. Our birds of prey think the new grass covered perches are much better too. It makes such a difference then just providing soft towels. It much more of a natural looking enrichment and protects them from conditions such as bumble foot. One gull has been so impressed he has even danced in circles waiting for a worm! Poor Kathy has managed just 4 nights without having any baby pigeons to deal with. Now she has 2 which have come in needing her attention. 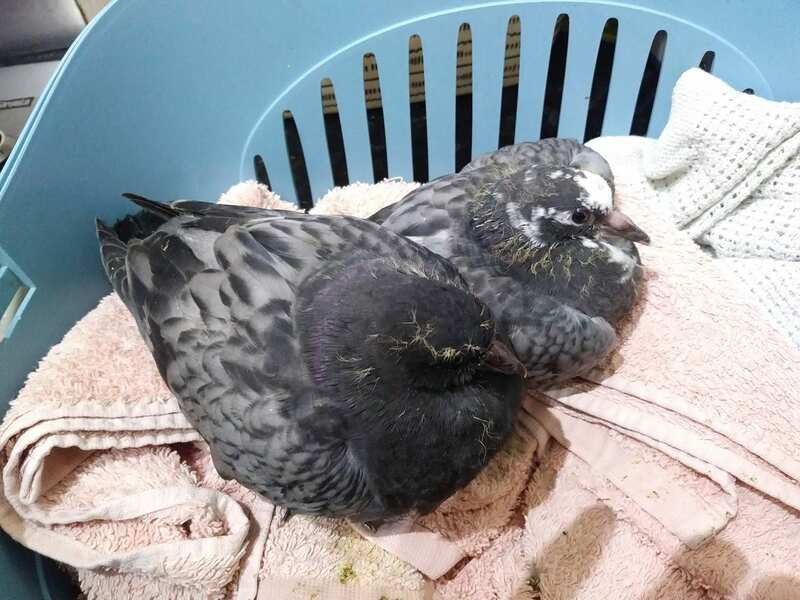 They were from Burgess Hill and fell out of their nest 2 days ago, but were advised by another organisation to just put them back, and they promptly just fell out again and we were asked to take them in. Kathy has named the first one Frosty and he is fairly unharmed, but the second one called Rudolph had a bloodied nose and bleeding in his throat from his fall. They may not have been fed for a couple of days, and are enjoying some fuss and attention now at Kathys. Kathy was pleased to say goodbye to our last 4 wood pigeon babies of the year. Two of them had been in our enclosed indoor pen for a few months, growing back feathers and gaining flight strength as they were runty, the other 2 had recently been weaned, they went into our outdoor pen where a hatch was left open for them to come and go as they pleased with food still available inside, they were able to ‘fledge’ straight into a large fir tree next to the hatch. 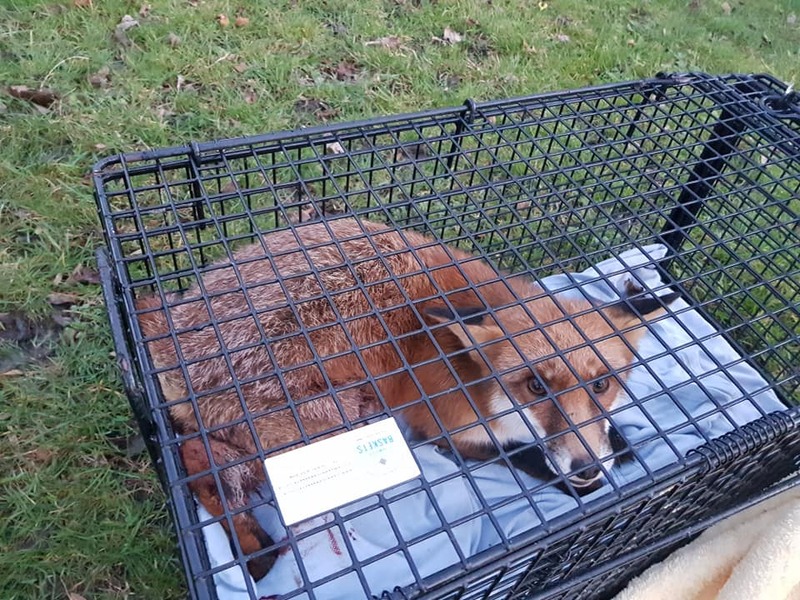 Rescuers had an emergency call to attended a poor fox that was trapped in a fence by a hind leg. The leg had got wrapped in the wire and had worn the tissue to the bone. 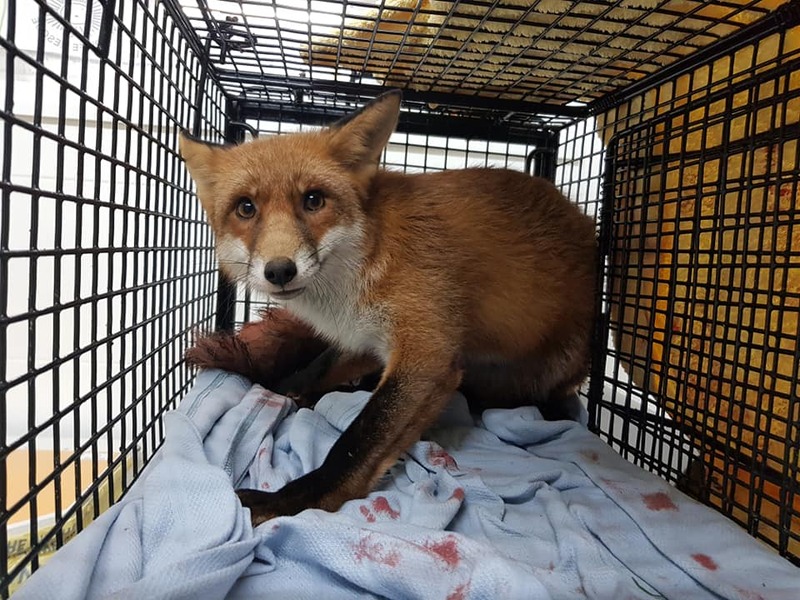 Rescuers cut the fence and took the fox back our hospital where our care team cleaned and bandaged the leg. The team are due to reassess the injuries this week and see how they are healing. If you come across any animal with a rear leg strung up caught in stock fencing, please do not just cut it free. It is unlikely to just run off and is almost guaranteed to have an injury of some description. The creature could have a fracture, a dislocation or an invisible ligature wound which can in some circumstances be fatal. The best thing you can do is cover their head with a blanket or large towel if you can get close enough without the creature trying to struggle too much. Otherwise just back off and keep out of sight behind a hedgerow and keep noise to a minimum. This way they will rest and conserve energy. The limb will already be elevated so blood loss will be minimal. 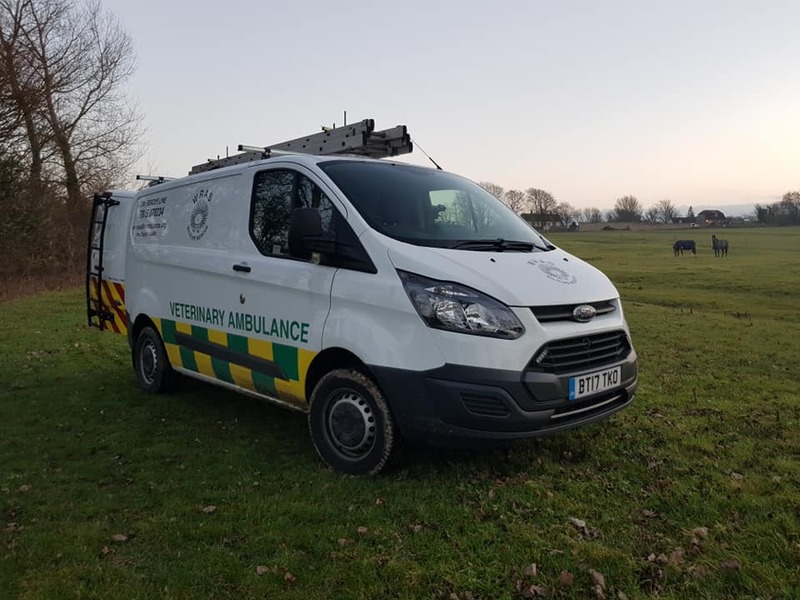 Also the animal can not try to escape easily, making the job of the rescues much easier to catch and secure in order to get veterinary attention. Next week in Christmas Week. We have a skeleton crew on duty all over Christmas, a bit thank you to all our volunteers and staff who will be working hard to keep the casualties in our care fed, watered and well looked after. So whilst eating your Christmas dinner and celebrating on New Year Day spare a thought for our amazing team.